A longtime fan of the Time-Life Foods of the World cook book series, I especially love the images of America in the 1960s. Although not that long ago, it seems like another world, one I just missed but still hope to find in the forgotten corners of America. A clam chowder would involve a morning digging for clams, a bushel of sun-kissed vegetables would need to be cooled in the river, an Easter ham would need a stiff brush to scrub the mold off the smokey hide from the previous winter's curing. To go full Norman Rockwell; it was a larger, wider, wilder America. Among those images, one thing that fascinated me was the photograph of a mule pulling a pole to run a grinder. A sun-burnt man pushes sticks of sugarcane into the spinning wheels of the grinder. Well, I thought they were sugarcane, but the caption explained to me that they were actually sorghum. Today, about 50 years later, sorghum has become somewhat en vogue. While I feel like I should protest and say, "but, but...I knew about it years ago!" I do owe it to the current popular interest that I've been able to acquire sorghum quite easily today. Not to say that there's not something rather lackluster about claiming to know about an ingredient for years when it's been used for generations by Southerners. 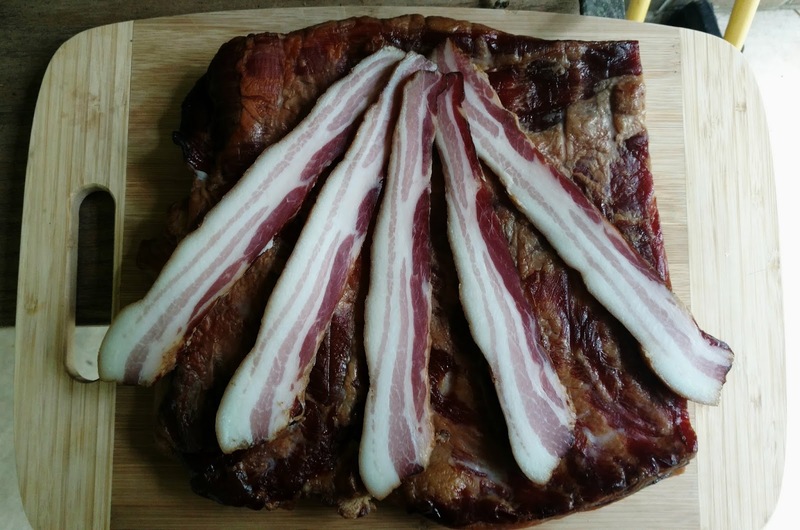 Digression aside, this is my latest experiment in bacon. I love the honeyed, grassy aroma of sorghum, followed by its molasses-like-but-lighter flavor, intense sweetness, and almost apple-like acidity. In curing this slab of bacon I just substituted the brown sugar from my usual bacon recipe for sorghum at a 1:1 ratio. I love the burnished mahogany look of this bacon, which also has a killer flavor! There's a slightly unique flavor from the interplay of smoke and sorghum. One big difference in this bacon is that it can get dark very quickly, so it needs to be cooked gently in a skillet over low heat.